In the wake of the September 11, 2001 attacks, interest in Lewis' work surged, especially his 1990 essay The Roots of Muslim Rage. Lewis is also known for his literary sparrings with the late Professor Edward Said of Columbia University, who critiqued Orientalist scholarship (of which he claimed Lewis's work was a prime example) in his seminal 1978 book, Orientalism. 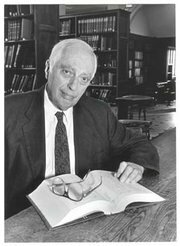 Bernard Lewis has written over twenty books and numerous articles. Among his more recent books are two that were published after 9/11: What Went Wrong? (written before the attacks) and The Crisis of Islam.